Most people think that getting inked up is a fairly harmless activity, but for a significant percentage of people, that's not the case at all. 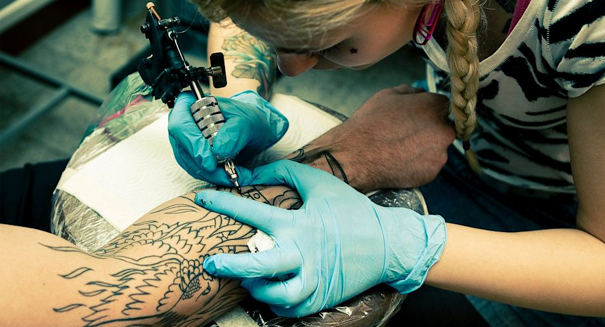 Getting a tattoo can be a fun experience for many, but it can turn into a pretty nasty one for a significant percentage of other — much more than most people had previously realized. As it turns out, a solid 10 percent of people who get tattoos see their skin flare up in ugly ways — and sometimes for a long period of time, according to a recent study that involved interviewing 300 people at Central Park in New York City about tattoos they had recently got. The study was published in the journal Contact Dermatitis and was reported on by NBC News. The study, which involved interviewing 149 men and 151 women who were over 18 and had gotten their tattoos in the United States, found that 4 percent of those who had gotten inked up ended up with a skin rash, and an additional 6 percent had skin problems that stuck around for more than four months. And they weren’t mild rashes either much of the time: particularly for those who got colored tattoos, the skin rose up for some people as much as a centimeter above the surface of the skin, resulting in a scaly texture. Other symptoms included itchy, raised rashes that were sometimes filled with edema. Red ink seemed to be the most irritable pigment for most people. Why is this the case? Scientists believe allergies play a role in it. They found that in two-thirds of people who had skin problems from tattoos also had allergies, compared to just one-third of those who didn’t have any problems with the tattoos.